The San Juan de Ulloa Hotel, located at 32 North Orange Avenue in Downtown Orlando, Florida, in 1940. The building was constructed from 1885 to 1886 by Captain C. E. Pierce at an initial cost of $150,000. The original owner was Henry S. Kedney, who moved from Minnesota to Maitland in 1870 and then to Orlando in 1885. The initial building was a three-story, wood-framed building topped with a dome. In 1887, Harry L. Beeman moved to Orlando and bought the San Juan Hotel. He added two stories and a new addition for $500,000 around 1900. From 1890 to 1900, it also housed the Downtown Orlando Post Office. In 1903, Beeman added a veranda on the north side. In 1914, Henry Green took charge of $20,000 in alterations, including the addition of a laundry room, 12 private baths, and the conversion of the barbershop into a café. In the spring of 1922, Turner Construction Company added an additional eight stories at a cost of $357,000. In May 1928, there was a plan to spend $150,000 to rebuild it along modern lines but it is not known if this was carried out or to what extent. The hotel also housed a series of services for hotel guests and Orlando residents alike. Among these were several restaurants, a barbershop, and a laundry. The San Juan was the main focal point for activity in Orlando in the early years, but the hotel hit hard times in the 1960s and was re-opened as the Grand Central Hotel, which opened on October 6, 1978. The Grand Central served a gay clientele, featuring several themed bars and lounges. In 1979, the hotel was destroyed by fire. The building was eventually demolished in 1981. The current use of site is a business office originally known as the First Union Bank Tower. It is a 16-story, 300,000-square foot building, completed in 1983. Original black and white photograph by O'Rork Studios, February 27, 1940: Private Collection of Texann Ivy Buck. Digital reproduction of original black and white photograph by O'Rork Studios, February 27, 1940. "Central Florida GLBT Timeline." GLBT History Museum. http://glbthistorymuseum.com/joomla15/index.php?option=com_chronoconnectivity&Itemid=62. 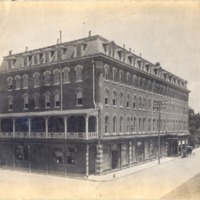 “San Juan de Ulloa Hotel, 1940.” RICHES of Central Florida accessed April 24, 2019, https://richesmi.cah.ucf.edu/omeka/items/show/7415.